Pharmacokinetics is a key pharmacological property of any drug. Pharmacokinetic sampling and pharmacokinetic analysis are fundamental procedures in phase 1, early phase and clinical pharmacology trials. 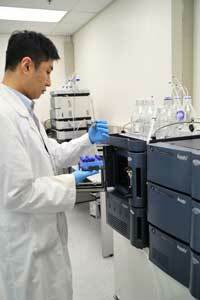 HKU-CTC provides pharmacokinetic analysis services through the HKU Pharmacokinetic Laboratory. The laboratory is equipped with state-of-the-art analytical instruments for separation and quantification of drugs and their metabolites in pharmacokinetic samples, supporting further development of new drugs and registration or procurement requirements for generic drugs.